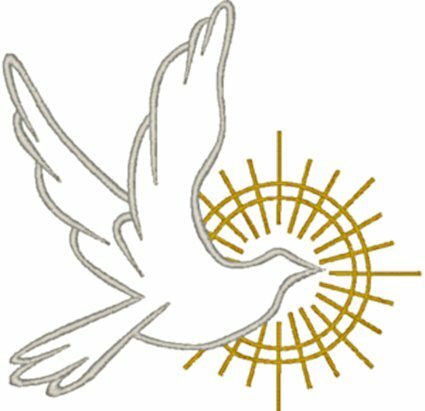 The dove is a symbol of the Holy Spirit and is used especially in representations of our Lord's Baptism and the Pentecost. It also symbolizes the release of the soul in death, and is used to recall Noah's dove, a harbinger of hope. The sewn out size for the 4" x 4" hoop is 3.89" W x 3.85" H with 7,326 stitches. The sewn out size for the 5" x 7" hoop is 5.05" W x 4.99" H with 9,108 stitches. The sewn out size for the 7.75" x 11.75" hoop is 7.75" W x 7.66" H with 14,632 stitches.